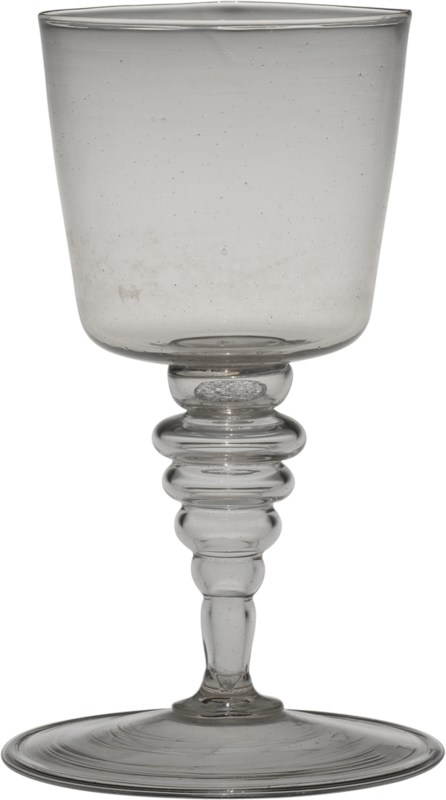 This wineglass contains a silver coin, which is found in the stem with many constrictions. Although it’s not immediately evident, this goblet consists of four bubbles of glass. The first will become the cup, or uppermost part of the goblet. The glass is gathered from the furnace on the end of the metal blowpipe, rolled back and forth on the marver to make the glass perfectly round and to elongate the mass. Air is blown into the pipe, and the bubble begins to form. The tip is hotter than the rest of the glass and must be cooled by rubbing it on the table. The process of forming the cup by blowing and tooling now begins. A constriction is made near the blowpipe. The glass is pulled longer, inflated, pulled longer again. The constriction is finalized, and excess glass cut free from the tip of the bubble. The lower half of the bubble is reheated. The jacks are held against the side, and with the rubber tube, air is blown into the pipe. This creates the shape of the lowermost part of the cup, or goblet bowl. This is left slightly conical. A small amount of glass is gathered on another blowpipe, marvered, air blown into it, and this is lowered onto the tip of the bowl. The glass is cut free of the blowpipe, and a constriction is made to allow a hole to be formed in the end of this bubble. The constriction is cooled with the soffietta, held with the diamond shears, and the excess glass cut free. The edge is reheated, and the jacks used to open the hole. A tiny silver disk representing the coin in the original goblet is dropped in. The hot metal begins to stick to the glass slightly. Another constriction is made, the excess glass trimmed free, and a third bubble created, giving a broad constriction near the blowpipe, and carefully lowered onto the second bubble. This is cut free of its blowpipe, and the jacks are used to create decorative constrictions. The tip of the stem is trimmed to give it its final length. A small bit of glass freshly gathered from the furnace is attached to the end of the stem and tooled to create a merese. This is pressed upward gently to make a very strong bond with the stem. A fourth bubble is added, cut free of its blowpipe; this will become the foot of the goblet. A constriction is made, the excess glass trimmed free. The edge of the bubble will become the edge of the foot. The soffietta is used to cool the lowermost part of the stem. This unavoidably heats and softens while the foot bubble is being reheated. 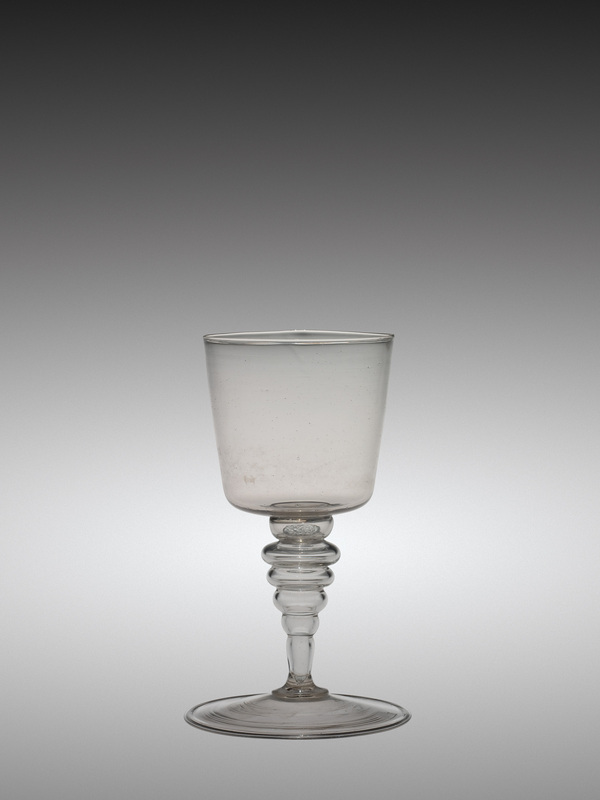 This goblet has a folded edge—a double thickness of glass. It’s both attractive and strong. The vessel is transferred to the punty (or pontil). It’s simply a handle. The neck is broken free of the blowpipe, and the opening reheated. 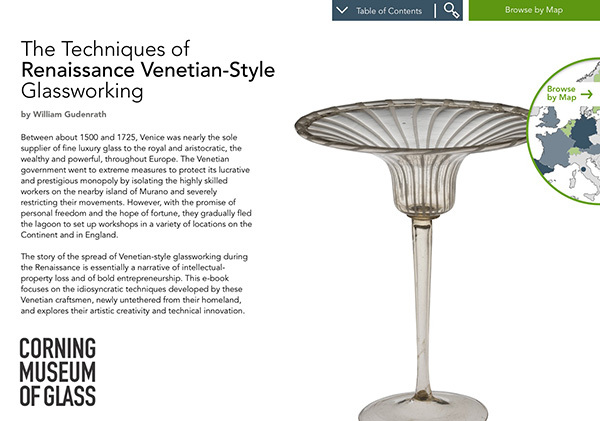 The edges of 16th- and 17th-century Venetian goblets is exceedingly thin, and a special lip-thinning procedure must be used. Excess glass is trimmed free, leaving behind only the thinnest glass. A combination of reheating, tooling with the jacks, and blowing with the soffietta is used to create the final opening. The finished goblet is flashed in the furnace, broken free of the blowpipe, and placed in the annealing oven. After cooling, the silver disk which we saw stick to the hot glass has contracted, lost volume more than the glass. With a slight tap, they break free.